The next step in the evolution of southern Mexican FOOD, Habanero’s TACO CO. combines the best of YUCATAN cuisine with a bit of TEXAS flare. Step in and vacation for a little while in a Cancun-like atmosphere full of Salsa music, amazing food & drinks. OUR FOOD IS A FUSION OF CARIBBEAN FLAVORS FROM THE MAYAN RIVIERA & MEXICAN FAVORITES. WE USE FRESH, TROPICAL INGREDIENTS LIKE BANANA LEAVES, COCONUT, HEART OF PALM, HABANERO PEPPERS, PINEAPPLE, PLANTAINS, BITTER ORANGE & ANNATTO. 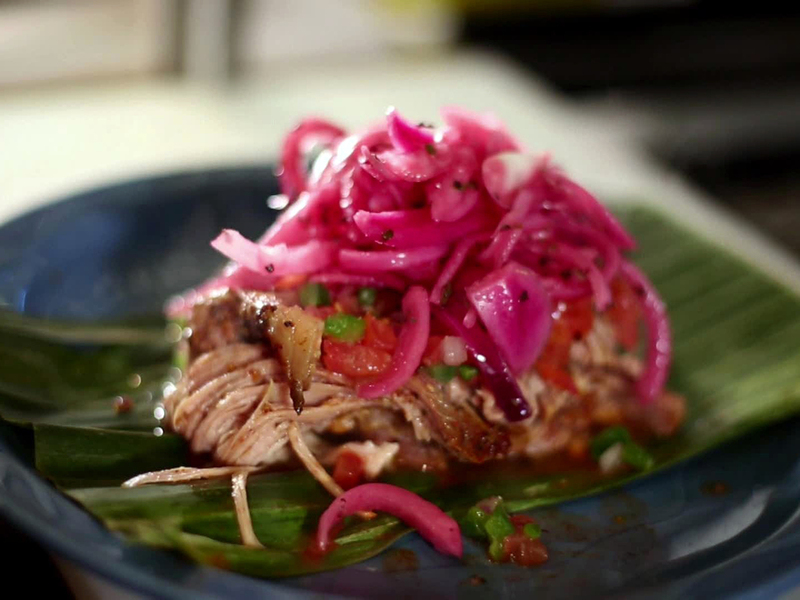 SLOW ROASTED PORK, MARINATED IN ANNATTO & ORANGE, AND WRAPPED INSIDE BANANA LEAVES. SKIRT STEAK MARINATED IN A CARIBBEAN PESTO. FRESH SHRIMP & FISH COOKED IN LIME AND TOSSED WITH PICO. TORTILLA CHIPS SIMMERED IN RED SALSA & TOPPED WITH PICADILLO, CHICKEN OR EGGS. FRESH MARKET FISH FILLET STRIPS, PANKO CRUSTED & PAN FRIED. TOPPED WITH OUR MILD CHIPOTLE DRESSING. SNAPPER FILLET TOPPED WITH A CREAMY POBLANO & SHRIMP SAUCE. CHOOSE ANY 3 TACOS, SERVED WITH SPANISH RICE & REFRIED BEANS. SWEET PLANTAIN TACOS TOPPED WITH BRINED RED ONIONS & QUESO FRESCO. GROUND BEEF ENCHILADAS TOPPED WITH MILD RED SALSA & QUESO FRESCO. TOMATO BASED BROTH, WITH DICED CHICKEN BREAST, AVOCADO, PICO & FRIED TORTILLA STRIPS. Our name does not denote “spicy food,” but in turn it conveys a way of life; A relaxed, guayabera-wearing, sunset-strolling, beach-dwelling, way of life from the Latin Caribbean countries; especially the Yucatan Peninsula in Mexico. So come in and let our food take you on a trip through the real Mexican cuisine. We’re always excited to have more people fall in love with our food.